A new, majestic piece of architecture is added to the series of buildings that constitute the Fantoni Campus in Osoppo (Udine), in Northern Italy. It’s the manufacturing building “Plaxil 8” by Studio Valle Architetti Associati, designed by Pietro Valle together with architect Roland Henning, engineer Mario Gallinaro and manufacturer Dieffenbacher. Here, in the heart of the Fantoni Campus, Plaxil 8 was recently erected, substituting obsolete plants with new technologically state-of-the-art equipment to produce MDF (Medium Density Fiberboard). An 80-million euro investment that, according to the company’s vice-president Paolo Fantoni, represents one of the most remarkable investments in the last few years in the wood furniture sector. Its 28-meter wide, single span linear structure is supported by trusses. An inner concrete building houses facilities and a large metal frame supporting the various levels of the mat formation plant on the west side. On the long sides, two plenums intake air from the outside to create a natural convection cooling circuit, removing the heat generated by the machines and exhausting it as hot air to a vent located on the ridge of the roof of the 14.50 m high linear section. With this new building and with the recent restoration and extension of the company restaurant, also designed by Pietro Valle, the tradition of Studio Valle in experimenting with industrial buildings and creating interplays with the continuously evolving industrial landscape of the location continues. And the everchanging mutation of the Fantoni Campus also goes on. The relationship between Studio Valle and Fantoni is founded upon an open and creative dialogue with time, a dialogue which accepts the unexpected and adjusts to change, integrating both into a continuous planning process based not on pre-fixed plans but rather on very precise ideas regarding the transformation process. 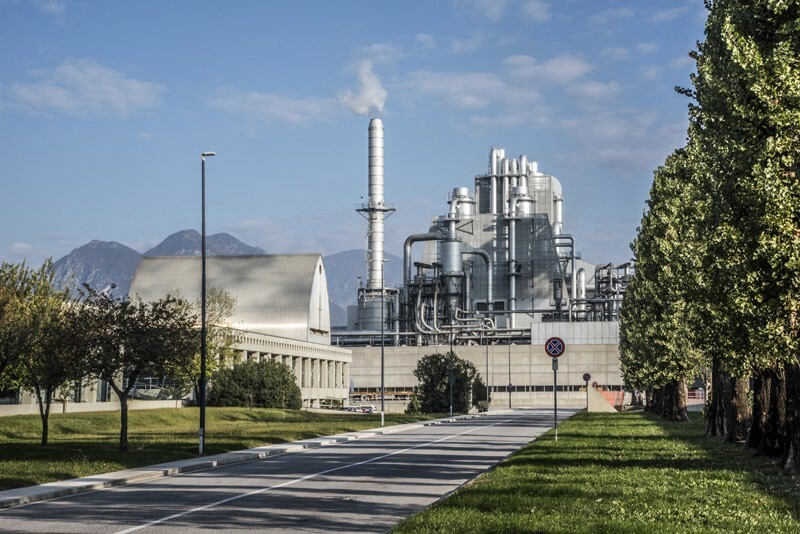 The production facilities of Fantoni Arredamenti are located in the Rivoli industrial area near the town of Osoppo, in the alluvial plain at the outlet of the Tagliamento river valley, north of Udine. All the buildings built on the Fantoni Campus between 1972 and 2001 were designed by Gino Valle. They testify his continuous collaboration with the president of the company Marco Fantoni and they constitute an exceptional example of seamless growth for a project over time, marked by constant experimentation on industrial architecture. The relationship between Gino Valle and Marco Fantoni is founded upon an open and creative dialogue with time, a dialogue which accepts the unexpected and adjusts to change, integrating both into a continuous planning process based not on pre-fixed plans but rather on very precise ideas regarding the transformation process. This ongoing relationship, developed over the space of thirty years, has had a profound influence upon Fantoni, even if Valle never directly asserted his identity with the group. In his capacity as architect and interior designer for Fantoni, he has worked on a practical and rational basis, applying his sensibility to both environment and materials. Each new building assumes an identity which causes one to reflect on that which preceded it. At the same time, it does not transcend what already exists but causes it to reappear in a new light. Both past and present assume a dynamic quality and create a complex landscape within which no object is viewed in isolation but rather in relation to others. It is by means of this constantly shifting identity that Valle is able to recover the past – his own past – and cause it to interact with the present: the original building or object is never eclipsed but becomes a new dialogical element of the whole. And this is how the Fantoni complex has developed – a collection of buildings added to over the years which appears not to conform to any general plan. While a connection between them exists, it has shifted over time: the decision to place the block of office buildings at the heart of the production plant and not separate to it, shows that Valle considers each structure not as a unit in itself but as something which is placed within the midst of other entities and which assumes an identity from its juxtaposition with these. The great colonnade is a focal point and is central to the spatial organization of the manufacturing settlement, precisely because it is surrounded by the neutral containers of the warehouses. The Fantoni complex does not therefore merely create a dialogue with the Tagliamento valley as Valle maintains, but also forms a connection with the mobile landscape of the various structures existing within it. The adoption of this term (“campus”), which is British in origin, suggests a predilection for informal installations as opposed to those which result from rigid planning. It also recaptures the notion of landscape, learned in America, which Valle applies not merely to geographic scale but also to the relationship between the buildings and to a dialogue with the surrounding spaces, which serve as a link between the various elements. The Fantoni complex is best described not in terms of a city but rather a garden containing a variety of different forms which is transformed with each new additional structure. The individual buildings are profoundly ambivalent: they are geometric in shape and yet at the same time are covered with industrial coverings which are on each occasion diverse. They constitute a composition of identifiable forms which dematerialise owing to the pattern of their metallic “skin”. They are minimal abstractions (cubes, cylinders, prisms), but are at the same time analogous to the cathedral, the temple, the bell, the apse, and in recalling these institutions, enrich the complex. These continuous shifts in meaning are influenced by the fact that it is impossible to view each individual structure as a single isolated entity and by the ongoing visual and spatial overlapping of what is near and what is far, what comes before and what comes after. Like individuals within a community, the structures change over time: Valle is not afraid to make changes to his finished work. Not only did he undertake to restructure the service centre following the earthquake of 1976, but he continues to fill the complex with more structures in order to understand the limits to which he can push modifications to his open plan. It is he himself who imposes change with his continuous experimentation with new construction procedures that follow the technological updates and production adjustments of the Fantoni Company that, since the 1980s, specializes in the production of MDF (Medium Density Fiberboard), in addition to furniture. The amount of modern industrial materials used in the last 30 years in the construction of the Fantoni buildings is truly remarkable: Valle has made use of a whole range of materials such as corrugated metal sheets, panelling and prefabricated structures without limiting himself to single solutions. Their continuous evolution creates a kind of archeological record of the ‘new’ and this can be clearly seen from the variety of contrasting structures contained within the Fantoni complex, in Osoppo. The buildings are constructed from a series of components but these combine to create forms which are always different. They are mobile elements within an environmental setting which is constantly evolving. Development through diversity, a constant re-elaboration of ideas, critical recontextualisation of the recent past, free experimentation with industrialized techniques, are all themes shared by Valle and Fantoni and are evidence of the reciprocal influences which exist between producer and designer. This approach is problematic as it is not founded upon certainty of any kind not even that relating to its communication. In fact it actually goes against recent assumptions of media communication which favours the deconstruction of complex entities into single messages or formulas. It is an approach which does not work on the basis of preconceived notions, which create a sense of permanence, but on the basis of their decomposition. It continually projects itself towards that which is external, in search of multiple connections with an existing context, an environment which is always perceived as a complex whole. And yet in spite of its uncertain nature, this approach succeeds in establishing a link between permanence and change, demonstrating that the importance of the ‘new’ lies in its redefinition of existing reality and not its replacement. That which is already in existence is made of concrete matter. The critical landscape created by Valle constantly brings existing architecture and furnishing design into play offering a different concept of time which is based neither on transience nor permanence but on a constantly evolving plan. The series of new projects conceived by Studio Valle for Fantoni starting in 2015, hence 12 years after Gino Valle’s death, are in continuity with the idea of modification that characterized all previous proposals. Gino Valle’s collaboration with Fantoni ends in 2001, as the company did not erect new buildings in Osoppo, the group growing in other cities. In 2015, Paolo and Giovanni Fantoni, Marco’s sons, contact Studio Valle. They realize that their buildings are getting old, they need to incorporate new technologies in the medium density sector, and they need help in redefining the existing complex. It’s the beginning of a new series of interventions on the Fantoni campus, all characterized by higher attention to environmental quality, to redefinition of the built heritage, to productive flexibility. All this is in line with the company’s recent trends that question the need for an unlimited growth and propose strategies of re-use of existing resources. The new approach redefines that idea of continuous change that was present already in the open configuration given by Gino Valle to all buildings on the campus. Studio Valle first restores the existing cafeteria building in 2015, that has been part of the facilities center since 1972, and turns it into the Company Restaurant. A new intervention that reveals the existing building, under a new skin. Studio Valle is also in charge of designing the envelope around a new heater and the extension of the production section of Plaxil 7 building. But it’s Plaxil 8 that triggers an extensive redefinition of the existing buildings, one that will continue for years to come. The new automated MDF (Medium Density Fiberboard) manufacturing line it contains will over time make the previous production lines obsolete. The existing factory buildings will gave to accommodate new machinery and functions, while the old warehouses already include new conveyor and stacks lines coming from Paxil 8. This gradual transformation in the production triggers a reflection of the role architecture has in modifying Gino Valle’s buildings. Not new containers any more, but assimilation of the existing ones in a new system of relations. The strategies of spatial integration between old and new, and between building and machinery, that are part of the design of Plaxil 8 will inform future projects. Plaxil 8 is an industrial building housing a fully automated MDF (Medium Density Fiberboard) manufacturing line. The line consists of a fiber sorting and mat formation section, a continuous hot press section and an unloading and stacking section. This plant replaces the previous Plaxil 4 and Plaxil 5 press lines, retaining however their existing defibrators and warehouses. 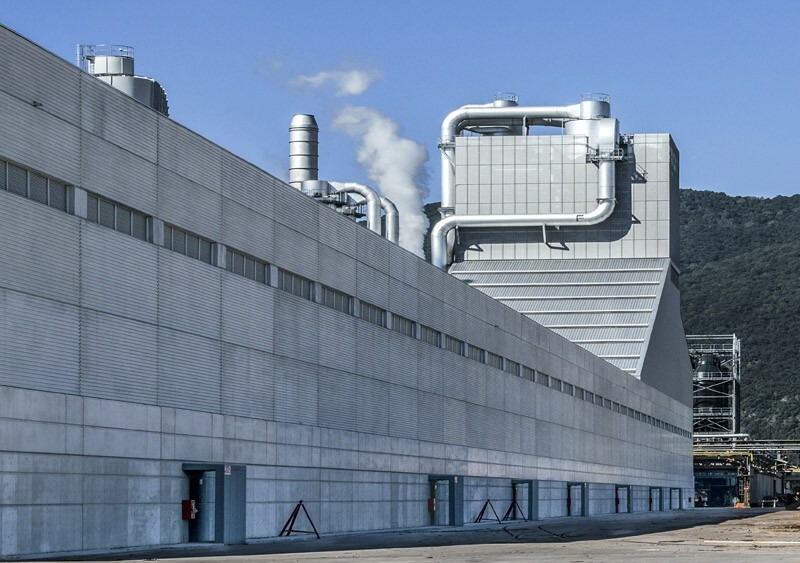 The building covers an area of about 8500 square metres within the Osoppo production site of the Fantoni group. It is situated among other buildings north of the Plaxil 5 “Cathedral” building, originally designed by Gino Valle in 1985. The building is 300 m long and 28 m wide. Its west side is over 50 m high, while the rest of the structure has an average height of 14.50 m. It is the largest press in Europe and the second largest in the World for the production of MDF boards, which are used for the manufacture of furniture, doors, interior panelling and soundabsorbing materials. – The mat formation area, where the dried fiber and resin mixture enters the line and is conveyed through gravity sorters, cyclones, bunkers and forming heads by means of a complex system of pipes and blowers. In this section, stacks and cyclones reach heights in excess of 50 metres. – The continuous hot press, which is about 75 metres long and weighs over 3000 tonnes, presses the mat to the required thickness, while heating it to a temperature in the region of 240 °C by means of a heat transfer fluid system to cure the thermosetting resin mixed with the wood fiber and transform the mat into a board. This line is housed in the linear section of the building, which has a constant height of 14.50 metres. – The unloading line, where the boards are first cut to size using a continuous-cycle diagonal cutting machine, and then cooled by natural convection on two large star-shaped coolers. The boards are then stacked and directed to the automated warehouses by means of a 400 meter long overhead conveyor line or an inductiondriven ground conveyor line. The unloading line is located inside the 14.50 metre high section also. The conveyor lines are independent structures, joining the Plaxil 8 building to the other existing buildings across the separating spaces. The same structure supports both the building and the machinery. The challenge of the design was in specifying a load-bearing frame shared by both the plant and the architecture with overlapping erection times. In the resulting solution we have opted for a 28 metre wide, single span linear structure supported by lattice trusses, an internal concrete building housing the service areas, and a large metal frame supporting the various levels of the mat formation plant on the west side. On the long sides, two plenums intake air from the outside to create a natural convection cooling circuit, removing the heat generated by the machines and exhausting it as hot air to a vent located on the ridge of the roof of the 14.50 m high linear section. The design process of the building had to take a flexible, step-by-step approach, and be led by the gradual development and sizing of the machine, which had never been built before. Several types of building envelopes were assessed, including metal, prefab concrete, and one made entirely of wood. The machinery, located mainly inside the building, is complemented by additional stacks, cyclones, and connection lines located outside the building envelope, mainly on its south side so as not to interfere with rail and lorry transport activities for the wood, which take place in the yard adjacent to the north side of the building. 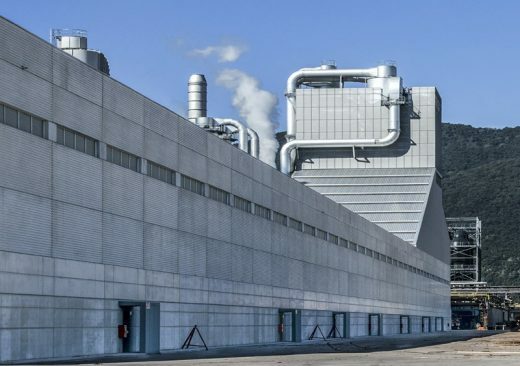 The building envelope interfaces therefore with the internal and external plant, while supporting a range of processing equipment which remains visible and connects the Plaxil 8 plant to the facilities nearby, establishing a network more than a stand-alone building. While defining the envelope, we looked at first into partitioning the 300 m linear extension into a number of modular house-like divisions, surmounted by a metal cornice located on the top of the mat formation plant, and featuring a large diagonal slope connecting the higher section to the lower section. Using that approach, the visual order of the building could have served as a counterbalance to the apparent random placement of machinery and lines. The final decision, however, was that of not contrasting individual building shapes against the machinery, but rather to ensure that the building would act as a backdrop and as a screen to the machinery, creating several levels of depth in the campus landscape. In this process of clarification of the role of architecture in relation to machines, the concept of INTERFACE has developed: the building is no longer a container that encloses the production process and represents it with an autonomous envelope, but is instead a visual scaffolding that dialogues with the machinery, involving them in the creation of a new landscape that includes interior and exterior, structure and production structures, new envelope and existing plants. The entire lower section of the building is clad using prefab concrete panels cast onto corrugated sheet metal forms, to create a continuous fretted texture setting out the metal vectors entering and exiting the building. The sloped section of the roof is also covered by reflective metal panels, ribbed vertically to retain the large diagonal “fillet” that characterises the silhouette of the building against the sky. The stacks and the cyclones of the mat formation plant are enclosed instead and partially hidden by an expanded metal mesh structure. These three types of cladding counterbalance the sight of the naked machines, while never conflicting with them. The existing structures enter into a dialogue with the new stacks and lines, and create a congruent skyline within the campus, a backdrop with multiple elements and scenes. This counterpoint is implemented by the network of connections that the transport lines of the finished panels coming from Plaxil 8 create with the existing buildings. In particular, the Rack Sigmat, with its lining in ribbed metal panels, is a new airy building composed of linear sections and centralized blocks that fly over the existing warehouses and join the “cathedral” of Plaxil 5. The interior also interacts with the machinery, left exposed, creating a new visual scaffolding for the production process. It has been possible to leave the structure in metal carpentry visible thanks to a special exemption of the Fire Department, justified by the fact that stacks of MDF panels, packaged for the final transport, do not let fire propagate and extinguish in less than a minute. This has made it possible to build a crescendo of lightweight overlapping frames with beams and pillars in double-T profiles that position the machines on different levels, obtaining a new internal transparency. The frame of the various levels of the mat formation plant more than fifty metres high, creates a spectacular vertical stratification while the sequence of reticular portals that enclose the press and the unloading line create an infinite linear perspective. Here too, it is not only the visible structure that defines the character of the interior, but its relationship with the machines placed at various levels: the heavy is supported by a light transparent scaffolding that puts the machinery on stage, placing them as if on a stage formed by various levels of depth. Again, the concept of “interface” informs the spaces of Plaxil 8 and the relationship between architecture and machine. Doing so, Plaxil 8 more than exceeds the previous idea of multiple discrete envelopes, and suggests an architectural discourse made of a succession of surfaces, extending past multiple buildings and glimpsed through the textures of the covers and the visual transparency of the screens. This “interface” strategy extends to the experience of Studio Valle in experimenting with industrial buildings and creating interplays with the continuously evolving industrial landscape of the location was instrumental to the success of the project.